After Linda Twining and Kathy Herring found that their artisan chicken pot pie was among the most popular items ordered from their frozen dinner delivery business, the pair decided to sell the product at the retail level. In 2007, Linda and Kathy, the co-owners of Twin Hens in Princeton, New Jersey, set out to create a shepherd’s pie with a gourmet twist. As professional chefs, they wanted to find an alternative to the standard recipe with mashed potato and decided to use a creamy polenta topping. Says Kathy: "We quickly realized that with a corn meal topping, we could easily substitute rice flour as a thickener and make our beef pot pie gluten free." 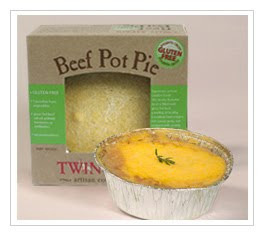 Twin Hens launched its gluten-free beef pot pie in early 2008. The Australian beef they use is grass-fed and contains no hormones or antibiotics. The beef pot pie, which takes about 45 minutes to prepare, also contains organic cornmeal and vegetables. In 2008, the product was awarded a silver medal in the Outstanding Diet/Lifestyle category at the National Association for the Specialty Food Trade show. The 11-ounce beef pot pie carries a suggested retail price of $8.95 and is available at area Whole Foods Markets, independent natural food stores and online at Gluten Free Mall.